I have been reading through the letters my dad wrote home to his family while he was in World War II. He was a 20 year old boy who was a long way from home, and was missing his family. Like most younger brothers, my dad looked up to his brother, my Uncle Bill, who was 2 years older than my dad. To my dad, Uncle Bill was a very sophisticated ladies’ man. He always seemed to have a girl or two hanging around him, and that was a well known fact. 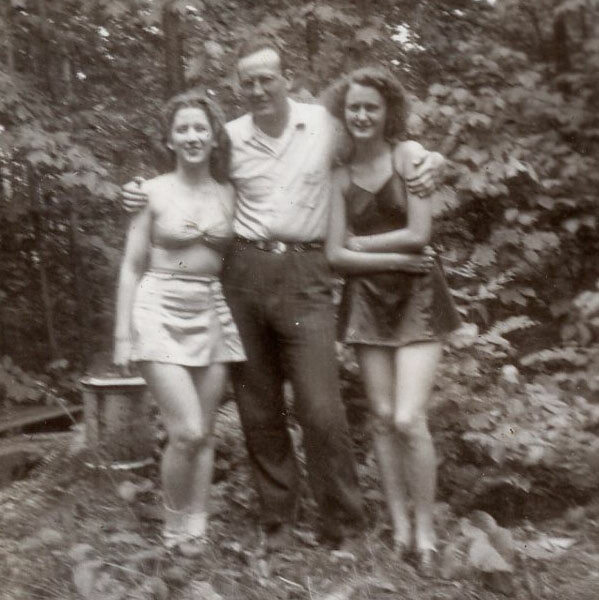 I have come across pictures of my uncle during those young years, and those girls seemed always to be there. Uncle Bill was a looker too. Both of those Spencer boys were. In Dad’s letters, he talked about the adventures his big brother was fond of having. It wasn’t that my dad wasn’t having adventures of his own, but…well, to him, his big brother was just cool, and like many little brothers, Dad looked at his brother and thought…maybe I could be like him. 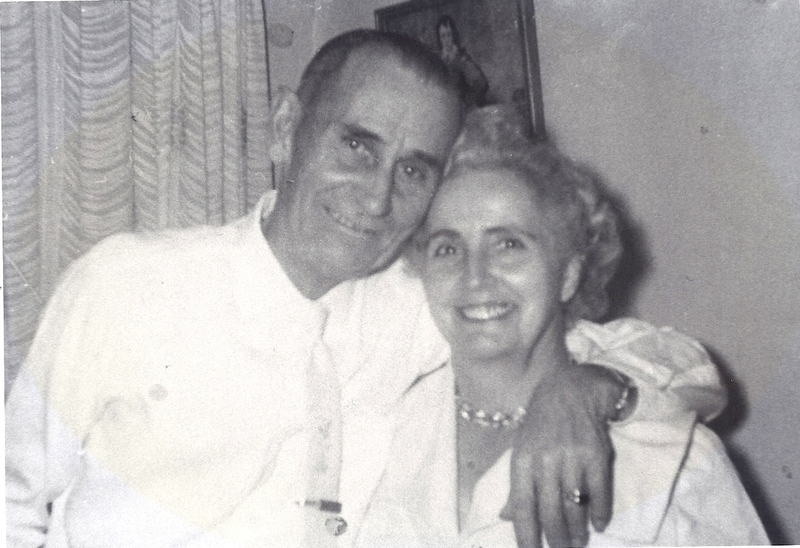 Dad hadn’t really grown into the wonderful man my mother married, or the amazing dad that he became yet. His brother was his hero to a large degree. 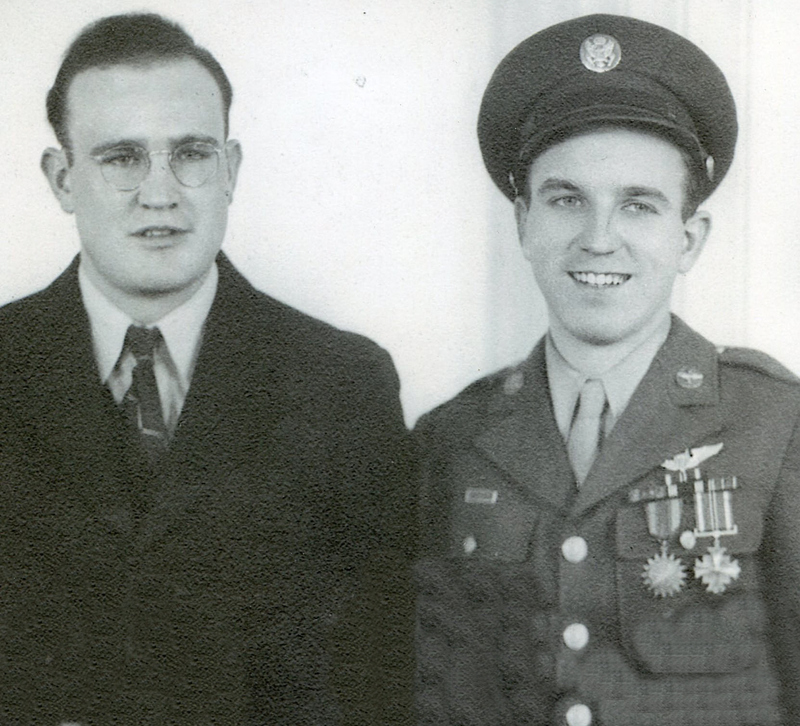 Today, my dad’s handsome brother is 90 years old, and his little brother, my dad has been in heaven for 4 long years. My uncle is still quite a character, and I wouldn’t be surprised if the nurses and aides around him still see a bit of that ladies’ man in him. It seems like as men get older, they like to flirt more. A trait that I find to be very cute, and endearing in the older men I know. They are always so complimentary, no matter how bad you might look that day. It’s just a sweetness they seem to have. My uncle lives far away in Wisconsin, and it’s not so easy for him to travel, especially as his mind is slipping more and more. My uncle has always been a history buff, and the family history was his personal passion. Through the years he has amassed a wealth of information on our family. It is information that might have been lost if he had not put it all together. Our family has been very blessed by the information Uncle Bill was able to gather. At 90 years old, I don’t know if Uncle Bill is still a ladies’ man, like many older men are, but I know that I have always loved my uncle very much. 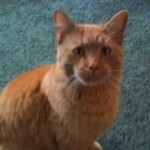 He was a good friend when I was growing up, even though we didn’t live close to his family. 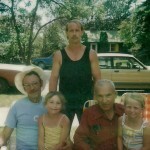 He was my Cribbage buddy, we wrote letters, and later we shared a love of the family history. 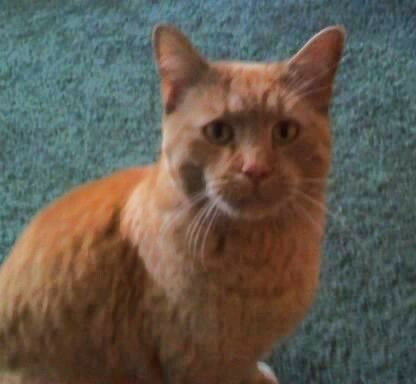 It makes me sad that he is getting older, but happy that he has reached the grand old age of 90. Happy birthday Uncle Bill!! I love you very much!! And once you got the snowman built…if you were blessed with a block full of kids, you were all set for a snowball fight. Of course, the first thing you needed to do is build a fort. You needed a place to hide from the incoming snowballs, because we all know what happens to that poor person who gets caught with out some form of cover. That person is really in a lot of trouble, because very soon, the snowballs are going to start flying, and they will not show mercy. It is nothing personal. It’s just the way the game is played. Survival of the fittest is the name of the game. Of course, it’s even more fun if that poor victim of the attack is your mom or aunt. 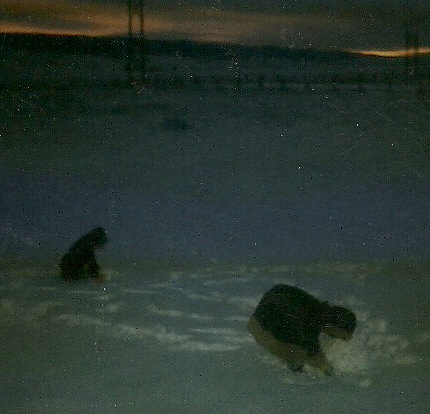 There were always so many ways to have fun in the snow when you were a kid. One of the most fun, of course, was throwing someone else in the snowbank…preferably a girl right. 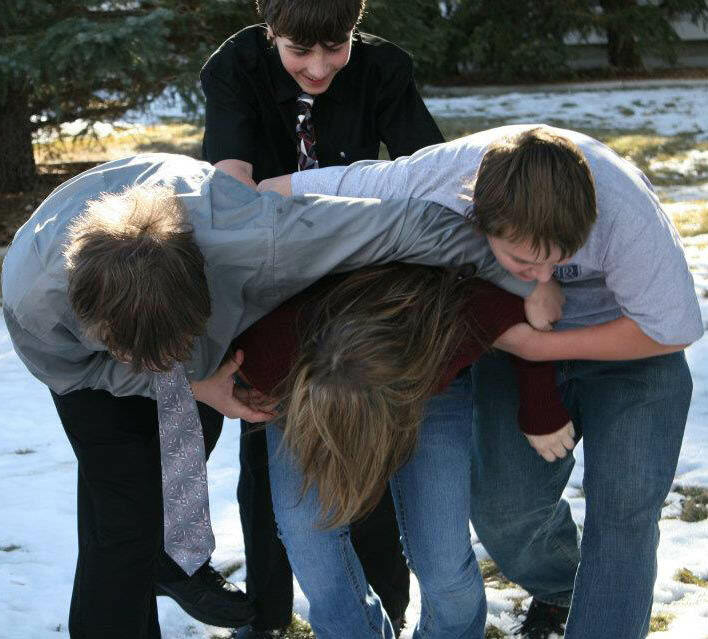 And when you get your three grandsons going against your only granddaughter…well, she is going in the snow. Even if she doesn’t want to mess up her hair and makeup, because she is going to the mall. Shai was a good sport when her cousins Chris and Josh, and her brother Caalab threw her in the snow, and rubbed snow in her face. For kids, snow days are the best part of winter. Hoping for a day off from school to hang out with your friends and cut loose a little. And in my opinion, it’s just as well that we like snow when we are kids, because many of us really don’t later on. Maybe it’s the driving in it, or maybe we just get more thin skinned as we get older. My idea of a good thing to do on a snow day…sitting in front of a roaring fire with a cup of hot chocolate, and reading a good book on my Kindle. Oh yeah!! That’s what I’m talking about. When you are small, and you don’t have much prospect of getting very big, you have 2 choices. You can take the teasing and even bullying that kids can dish out, or you can learn to take care of yourself. As an adult who is only 4’11” tall, you can imagine how little Amy was as a little girl. But don’t let her small size fool you, because if necessary, you will find that there is a tiger living inside that small frame. Of course, like all tiger cubs, Amy’s prowess developed slowly. 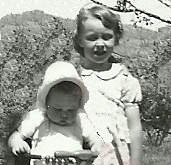 She first began by making sure that her big sister, Corrie knew who was the tougher of the two. Now Corrie was bigger, and 11 months older, but that didn’t matter. 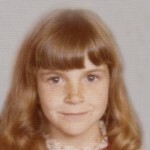 When Corrie was about 3, she came out of the bedroom the girls shared, crying. I asked what was wrong. She said through her tears, “Amy hit me! !” Now, coming from a family of five girls who fought plenty, I couldn’t see much sense in coming between them in their fight, so I told Corrie to “Hit her back! !” That brought immediate shrieks of terror as Corrie yelled, “NOOOOOOOO!! !” Now, I don’t know if Corrie was afraid she would hurt her little sister, or just plain afraid of her little sister, but she never would hit her back. It was probably just as well that Corrie didn’t hit Amy, because through the years, they have always been good friends. They never did fight very much. I guess that it is pretty hard to fight alone, so when your sister won’t hit you back, the fight is…well, over! Now the same thing did not apply to other children who got on Amy’s bad side. 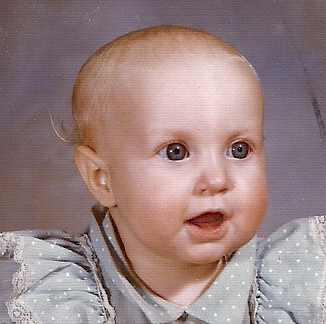 When Amy was just about 2 years old, and about the same time as Corrie’s little mishap with her, the girls began going into the nursery at the bowling alley, while I bowled on a league. One day as I was bowling, I heard this blood curdling scream coming from the nursery. It was a scream that I quickly recognized as my youngest daughter. I ran up to the nursery to see what was going on in there. I asked the nursery attendant what had happened…concern showing on my face, I’m quite sure. She quickly reassured me that everything was just fine…now. Then she explained that one of the other children in the nursery had decided that Amy was like a little toy doll or something, and tried to pick her up. Well, after that scream, that child…and all the others knew that you could play with that toy doll, but do not pick her up…ever!!! The years have flown by, and that little tiger cub is all grown up…though still not tall. There is one thing that I can say about Amy, and that is…she can take care of herself. She’s not a fighter or a bully. In fact, she really never was…even when she needed to defend herself. She is simply a force to be reckoned with. So, during her teen years, while I won’t lie and say I never worried, I did know that she was pretty capable of taking care of herself, and it really was the other guy who might want to watch out. Amy is a gentle spirit that is quiet and kind. She looks for friends, not enemies. She looks for the best in people, and that is a trait that maybe more of us should have…me included. 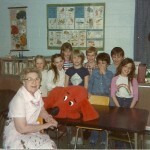 When my daughter, Corrie was in first grade, her teacher decided to use Clifford, the Big Red Dog, as a reading helper. Everything they did was based on Clifford. From their first books, to the stickers they received for books read. The students thrived under Miss Tyler’s unusual interest in the big red dog. 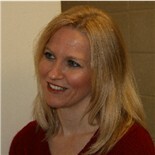 Corrie tells me that everyone loved Clifford. And not just in the books, because Miss Tyler had a huge stuffed Clifford. He was like a mascot for the class. In addition to Clifford, Miss Tyler had all of the Clifford books. It was like a big red dog addiction. Everything they did in class included Clifford. He was a great learning aid, because at that time, and possibly still for that age group, Clifford was the coolest thing out there. We never really know what things can help a child learn, but it is well known that children learn better with toys. I have always liked learning toys for my kids, and I could see how well this strategy had worked well for Corrie. Corrie tells me that the first book she remembers reading was a Clifford book, and that for Christmas, each student receive a Clifford book as a gift from Miss Tyler. Their entire year centered around Clifford. 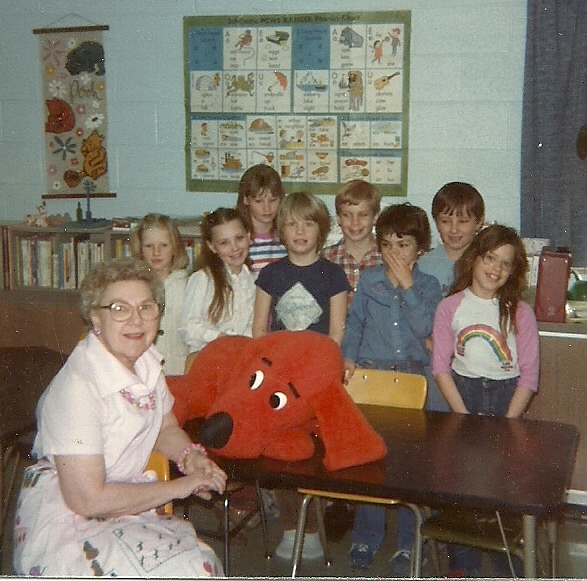 As rewards for good work, or good behavior, students were given the privilege of being in charge of taking care of Clifford. 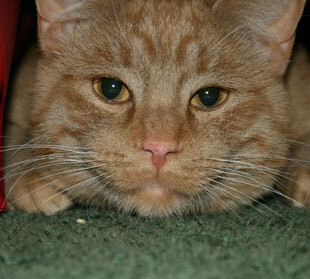 Corrie says that the students loved Clifford, almost as much as Emily, his owner did. When I was a young girl, our family took a vacation every year. By the time I was 12 years old, I had every possible worthless souvenir there was. It was at that point that I decided to change the plan some. I told my mom that instead of the silly souvenirs, I was going to start buying something that would have meaning for the rest of my life. She thought that was a great idea. So I looked around the souvenir store that we were in at Grand Coulee Dam, and found my first spoon. The decision…made by a 12 year old girl…began a lifelong collection for me. At first I kept my collection in a box, but later on that was going to be problematic. The spoons would be hard to enjoy, because they could only be looked at when I had time to go through the box, and no one else could really enjoy my collection. It was at that time that I came across the only souvenir I would buy during those years that was not a spoon. 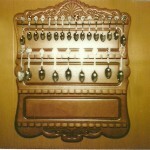 It was my first spoon rack, and it was beautiful as you can see. 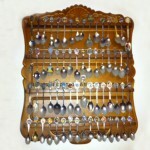 When I first bought the spoon rack, it didn’t have very many spoons on it, but the years have changed that. I have added many spoons from places that are very special to me. I have also been given spoons from all over the world, as friends and family members traveled to those places and were kind enough to spend their time to look for a spoon for me. I have spoons from places like the Statue of Liberty, the Golden Gate Bridge, the Space Needle, and the Grand Canyon, all of which I have had the privilege of seeing. I collected spoons from every state that I have been in. 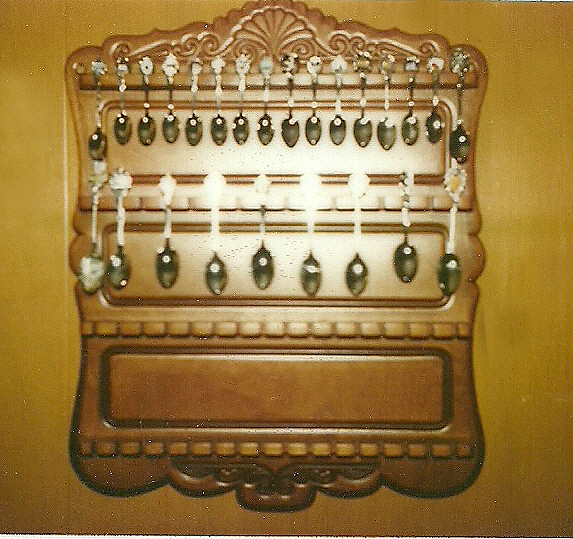 I have also collected many memories with each of those spoons. 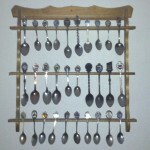 Then, as more of the people I knew began to travel out of the country, me spoon collection grew in ways I never expected. My ex-brother-in-law, Warren, who has remained a friend of the family since my sister’s divorce, contributed a great many of those out of the country spoons. Warren was in the Navy, and was required to go on cruises for long periods of times to many places around the world. Warren brought back spoons from Thailand, Hong Kong, Spain, Jerusalem, and Rome. My grandmother brought me one from Ireland when she got got go there…it was the trip of a lifetime for her, and that spoon reminds me of how much fun she had. My boss, Jim brought me a spoon from Israel when he and his wife Julie went there for their 25th wedding anniversary. These gifted spoons have a memory all their own for me, because while they are from places I have never been, I have the joy of knowing what each trip meant to the person who took it. Some were so special that they were the highlight of the travelers life. And they took time to do something nice for me. My collection will continue to grow as I travel and others do. 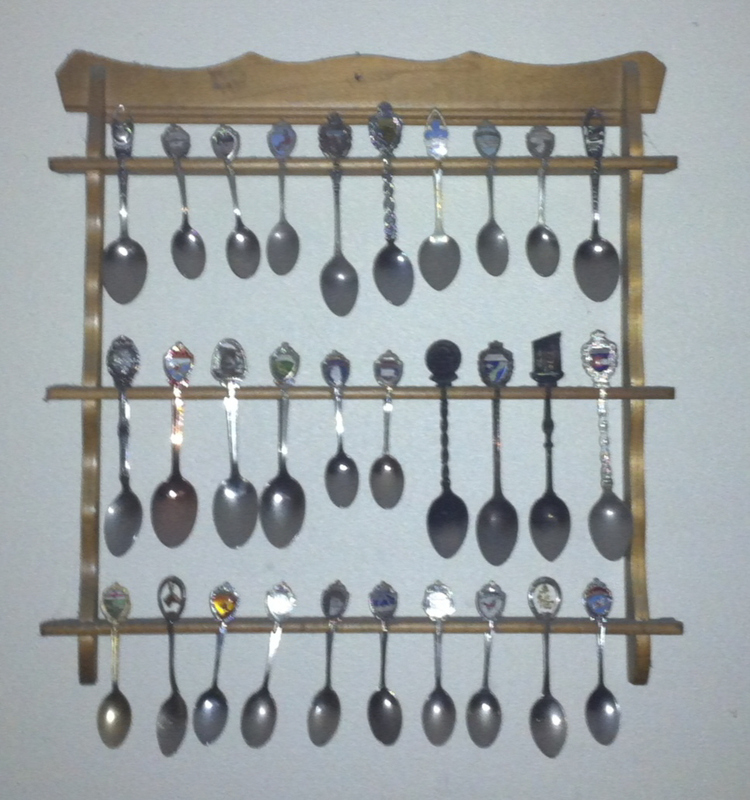 In fact, the collection as grown so much that I have had to add a second spoon rack, just to hold them all. It is almost like having a scrapbook that hangs on my wall. My spoons have their own stories to tell. When I look at my granddaughter, I see a beautiful girl, who is bubbly and very cool. She has changed through the years, but she has always been beautiful. 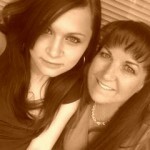 Many people have told me that she looks like me, and maybe she does, but she is far prettier than I am. Still, I see some things about her that do look like me. Sometimes, you have to look back on things to really see them. Recently Shai took a picture of her and me, and pointed out that we have the same eyes. 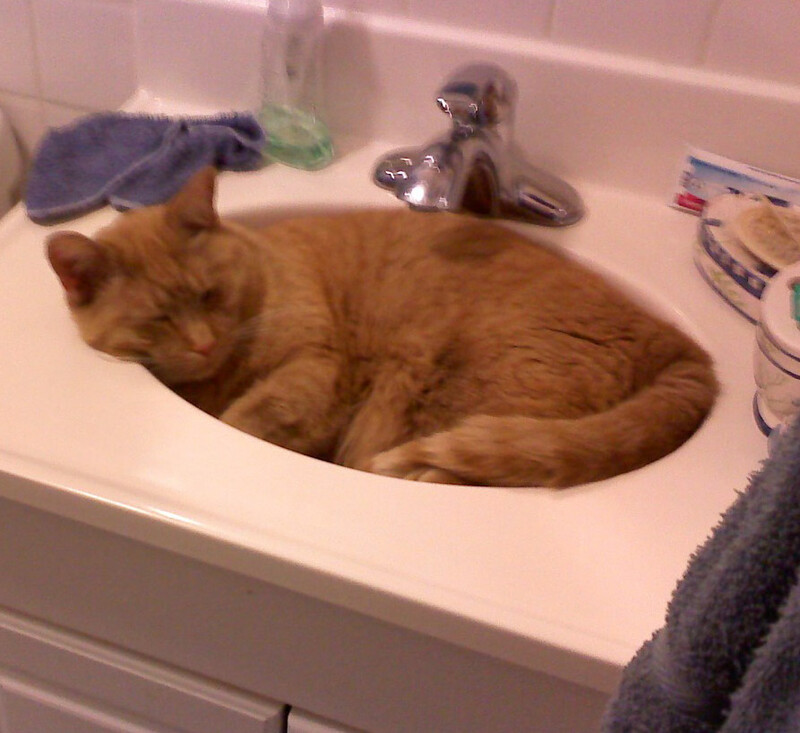 I hadn’t seen that before. They aren’t exactly the same, but they are close…except when she smiles, her eyes take a little upward turn on the outsides, that is so pretty. 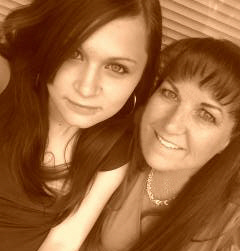 I had been told that my daughter Amy, Shai’s mom looks a lot like me and looking back on her pictures, I can see that too. Amy looks very much like me in the face, but with her blond hair, it is a little harder to see, for some reason. 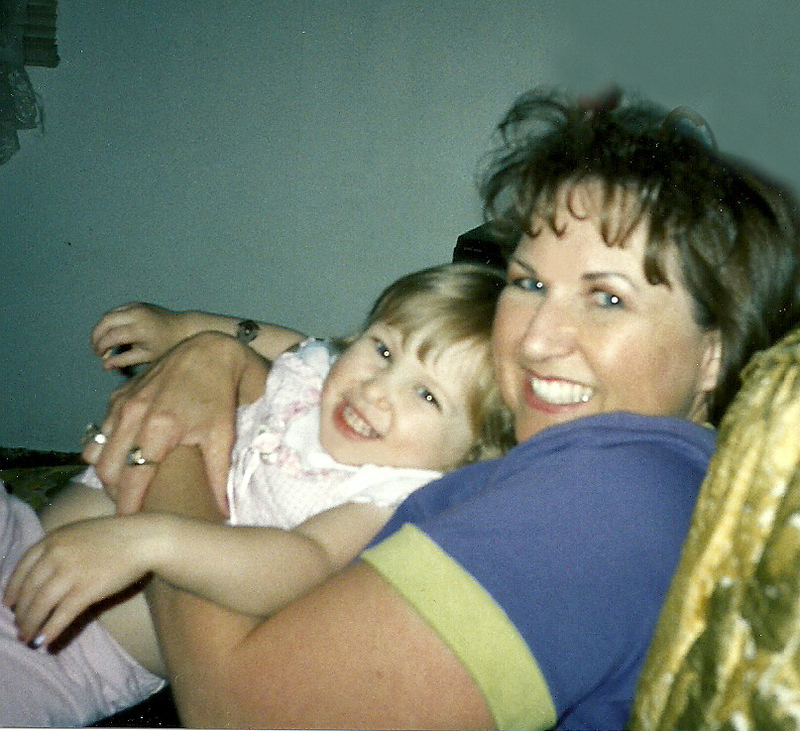 I had thought that my daughter, Corrie looked like me, but in reality, she looks much like my mother-in-law, and the only reason I thought she looked like me was her hair color. Perhaps, that is why I thought people saw similarities between Shai and me. Shai’s hair is brown like mine, and our coloring is the same, so looking at the pictures, it’s easier to see the similarities. Still, I did not see them until, I looked at the picture Shai took. Then, as with Amy, I could see that we do look a lot alike. When you have kids, and even with your grandkids, you always want them to look a little bit like you. I guess it is just human nature…the desire to reproduce another person who looks a lot like you. Maybe it is a way of connecting with our children and grandchildren forever. Or maybe I have had this on my mind because I have been researching our family tree. In doing so, I have seen many faces. Some that look like people I know, and some who don’t. The similarities can be in sisters, brothers, parents, grandparents, children, aunts, uncles, and even cousins. It is quite interesting to see. So often, it takes someone who never knew the people involved to really pick out those similarities. Still, sometimes when I look back on those old pictures, I am very surprised. I was going through my old pictures from when my grandchildren were real little, I found this one of Shai and me when she was just a little girl. It is one of my favorite pictures of the two of us, but as I looked at it, it occurred to me that Shai has a smile like mine…just like mine, in fact. I find that simply amazing. In big families, the younger children have the potential to become aunts and uncles at an early age. This can happen in families where there are a number of years between the children too. Sometimes, in fact, children can be born as aunts and uncles, which I suppose could be even more strange to think about. My younger sisters were were already old hands at being aunts at the time my girls were born, as my older sister had 3 children by that time. My youngest sister, Allyn became an aunt when she was the ripe old age of 8 years, in 1971, and so had been an aunt for 4 years by the time Corrie was born in 1975. 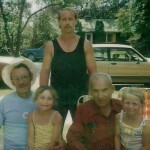 My in-laws basically had 3 separate families, since there were 7 years between Bob and his sister Jennifer, and another 5 between his youngest sister, Brenda and his brother, Ron. 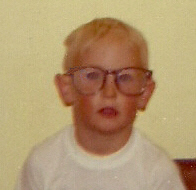 Ron was a whopping 7 years old when he first became and uncle. 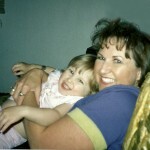 And my daughter, Amy’s youngest brother-in-law was 3 when he became uncle to her daughter, Shai. These kids grew up almost more like cousins or brothers and sisters than uncles to their nieces.They pretty much don’t remember a time where they weren’t uncles. My father-in-law’s sister Marian had 8 children, and her youngest son is younger than his nephew, her daughter Kathy’s son. I’m sure that would be odd to think about, if it weren’t just the way it was. I suppose when you are born an uncle or aunt, it never occurs to you that you might be a bit different from your friends, who like my daughters became aunts when they were both married adults. I’m quite certain that most people just think, “Well, that is the way it is.” And they would be right. You can’t control when you become an aunt or uncle. That is simply not your choice to make. And to most people it is an exciting and joyful time in their lives. But, that is not always the case. Bob’s Aunt Linda was quite a bit younger than my mother-in-law. Fifteen years, in fact. And my mother-in-law would marry my father-in-law just 2 1/2 years after Linda was born. 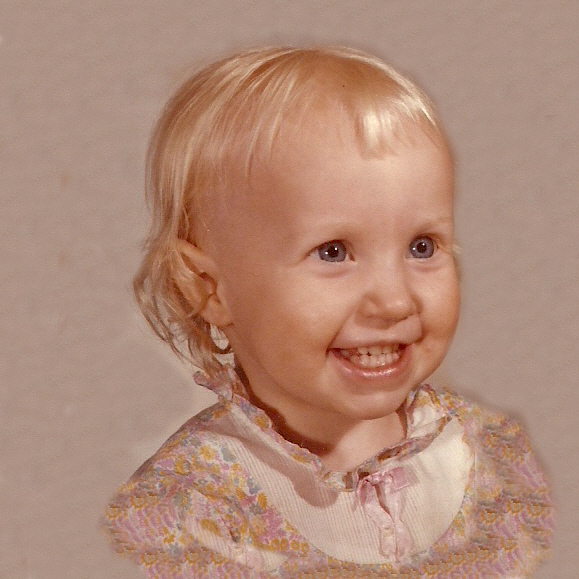 When my sister-in-law, Marlyce came along 13 months after their marriage, Linda was just 3 1/2 years old. She was just getting to an age where she knew what she wanted and what she did not want. When they came to Linda and told her that she was an aunt, Linda immediately started crying. They were shocked by such a reaction, and when they asked her what was wrong, she said, through her tears, “I don’t want to be one of those ant guys!! !” Poor little thing thought she was going to turn into a bug! 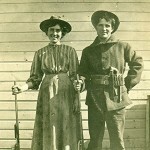 I have been researching our family histories for some time now, and I am amazed at the fortitude of some of our ancestors. 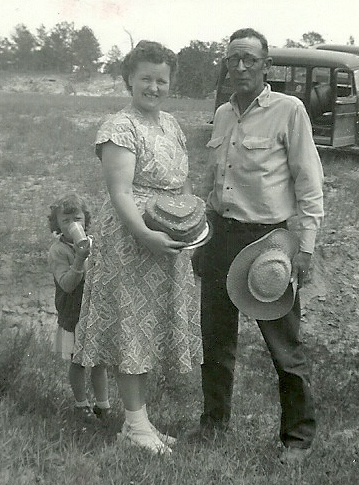 Bob’s great grandparents homesteaded in Montana in July 1911, and went through everything from a flash flood almost immediately, that washed away all of their belongings, but spared the family, to an early severe snow storm that dumped 15 to 18 inches of snow on their crops, freezing them. Bob’s great grandfather had to travel to the Elk Basin, Wyoming oil fields to make enough money to feed their growing family, and his great grandmother would take on odd jobs doing everything from cleaning houses to acting as a midwife. I realize that there are hard working people in all walks of life, and through the years, but sometimes, it really seems to stand out as unique and amazing. 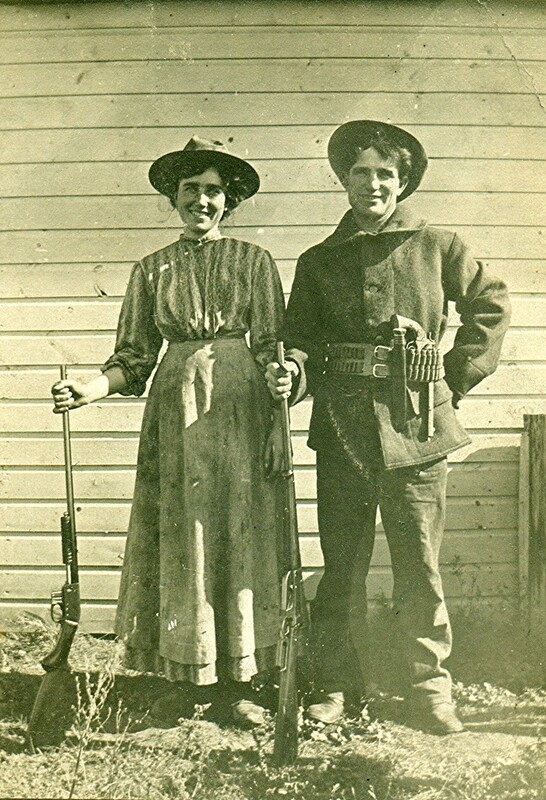 Bob’s great grand parents would go on to have 10 children. 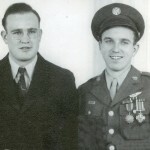 The oldest, Andrew was Bob’s grandfather. 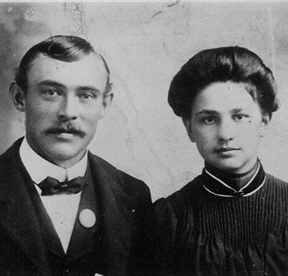 As a young boy of fifteen, he was accidentally shot in the leg while hunting antelope in October of 1921. He would spend 23 months and 11 days in the hospital, and would eventually lose his leg to that injury. I’m quite sure that was devastating to a fifteen year old boy, but he would go on to become the Sheriff of Rosebud County for many years. 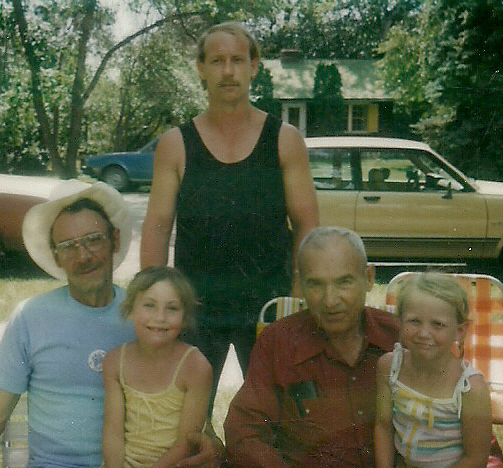 I did not know him for many of the early years of my marriage to Bob, as his dad and grandfather didn’t speak for many years, but in the later years of his life, they reunited and we got to know Grandpa Andy. I never knew what happened to his leg, until after his death, but I remember thinking it very unusual it have a wooden peg for a leg in the 1980’s. Of course, the leg had been that way for a long time, so I’m sure it was nothing unusual to Grandpa Andy, and so we gave it no further thought either. Adversity can and does hit people from all walks of life, and it is often that adversity that is the proving ground for that person. Some fall apart and are never really whole again. Other’s like Bob’s great grandparents and his grandfather, fight their way through the adversities in life and go on to do great things with their lives. Our ancestors had things much harder than we do. They didn’t have the modern technology that we have, and would be stunned by things we take for granted…like the internet and cell phones. They worked with their hands, scratching out a living on the land, because that was all that was available to them. Yet, while they weren’t tech savvy, they managed to build this country, turning it into the great nation it is today. They were the building blocks of a nation. We all have people in our past who ultimately shaped who we are today. Yes, our parents raised us and shaped much of the person we are, but where did their values come from. It was their parents, of course. 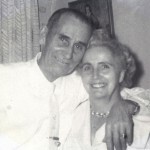 When I look back on who my grandparents were, and who Bob’s grandparents were, I can see traits in them and in their personalities that reflect on our parents, which reflects on us, and even some features and personality traits that have passed on to us. Sometimes the traits we have may have come from a grandparent who is even a step-grandparent, but who meant a lot to us, and so we adopted some of their traits. Part of who we are comes from the way we are raised or the world around us, but some things are not affected by those things. Those are the parts that come to us from our heritage…our ancestors. Bob and his dad both look a lot like his grandfather, his dad’s dad. That became very apparent to me when we met him for the first time. 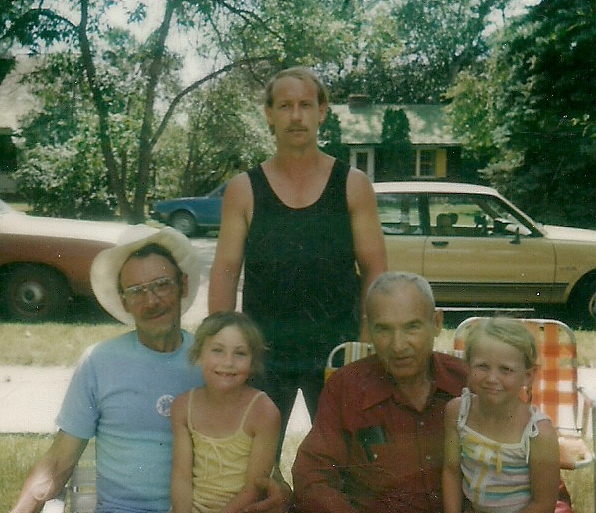 Bob’s dad had been estranged from his dad for a long time, and only reunited a short time prior to his death. During that time we attended a family reunion, and in the pictures, the resemblance was amazing. 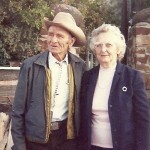 I think about my own grandparents. One set I knew, one set I didn’t, and yet it is the set I didn’t know, that I most take after. 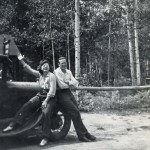 I am very much like my Aunt Ruth…my dad’s sister, and she seems to be much like her mother, my grandmother. It makes me wonder what my grandmother was like. Did she laugh like I do, and like my aunt did. I wish I could have known her, but she died when I was six months old. I’m told that she was an amazing woman…very strong and capable, and yet a tiny woman…as her wedding dress would tell me. My grandfather, my dad’s dad, was gone before I was born, and yet I think that we are a bit alike in that he was an adventurer…always looking for something new…just around the next corner. My dad was a lot like that too. He liked seeing new places…exploring new things. I’m sure that was why the railroad was always of interest to my grandfather. I think maybe some of my personality traits came from my mom’s dad. He was a gentle man with a soft heart. 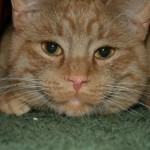 He was very soft spoken, a trait I wish I had received, but I’m not so sure I did. 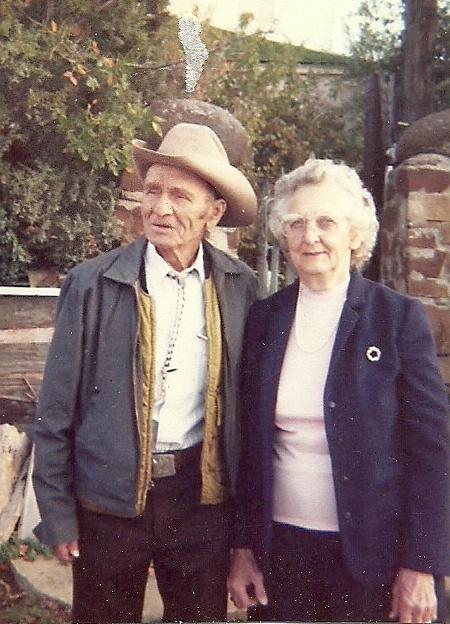 He was kind and compassionate, as was my grandmother…my mom’s mom. They really never met a stranger. And they helped many a person in need. While their family was large, and times were tough, they often had an extra mouth or two at the table in the evening, and they would never have turned anyone away. 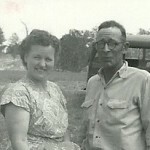 Our grandparents passed much of themselves on to our parents, who passed it on to us. The people we have become is in a big way related to the relatives from our past. Whether we know it or not, often, we follow in the footsteps of those who have gone before us.